Blogging helps to improve your local SEO, Know how? A Brands blog is always an advantage in many ways like client attraction and optimizing your local SEO. This article helps you in letting the user know “How a blog can help the business in improving local SEO”. Any business would find ways to improve their brand’s local SEO and accordingly, 18% of the local mobile phone search lead to a sale within a day. This pushes us to a mandatory situation on having a strong SEO ranking and mobile responsive feature. Any business premises would love to be ranked higher for many valuable and profitable reasons. Higher the local ranking, higher the profitability to the business, because it mainly focuses on business ranking in that particular geographic area and one of the ways is to help is blog writing. 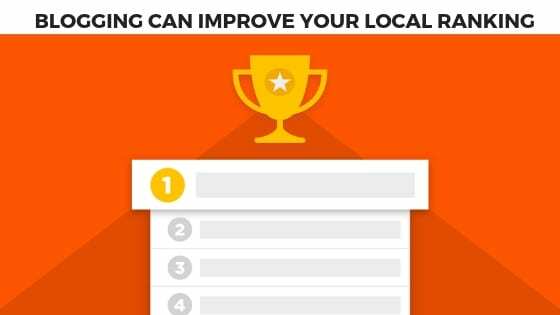 The first way to improve the local ranking is maximizing the indexing of the pages on your website. Blogging is mainly responsible for increasing the website’s rank by 434% with an increased page indexing, according to the recent study. Seriously!! Ok, indexed pages! What are these? By adding more pages to your website, the search engine with the crawler program will scan the content suitability in search results and therefore there are many chances that blog appears on the top of the page. But only if Quality of the blog takes over Quantity. Posting useful information clearly defines that blogs which revolve around the useful topics are the most searched once among the audience. The topics should mark its presence in such a way that the audience must be eager in knowing things or things which they care about. It’s really damn hard in choosing the topics that are relevant and trending, but make sure you reach with surprising factors in it. Sharing blog post helps in greater connection of people in that particular area. It further helps in higher ranking just because it’s shared on social media platforms. No Wonder the stats recorded the raising of an evolution of active users in social media where there is a chance of reading the blog. Hence it’s a wise decision sharing the blog posts on social media. Video content makes up the 80% of the world by 2020 and it’s said to be the most trendsetting marketing strategy followed by many companies for massive growth. But mainly, it’s said to be the trending factor in 2k18. Anyhow people prefer images and videos because the information is conveyed in a crisp and clear way which is easily understandable. Blogging will definitely help in raising the local ranking of the brand in many ways. Initial backlogs in blog writing few, but over a sustained period of time, the reputation and credibility will increase to its peak. A strong reputation will, therefore, will uplift your brand to further levels, but. Building a brand from a scratch is not an easy problem and raising it gradually through blog writing will help you to stand out from the crowd. The above ways are helpful in increasing local traffic from the blogs. And it is proven that more than 80% of the website traffic is directed towards the blog. It’s also considered as an excellent mode of communication with clients as it is always personalized. So, are you ready to build your brand through blogging? We are always there to professionally help you!! You can directly visit us for more details.